Calling all treasure hunters, bargain shoppers and vintage collectors. The Los Angeles flea markets offer everything from vinyl records to vintage clothing to custom-built furniture — a little something for everyone. Along with a small-town community feel, these open-air markets frequently offer food, drink, music and an opportunity to mingle with local collectors and friends. Spend a few hours — or even a day — visiting the various vendors or hunting for a hidden gem. Here's a brief guide to a few of the most popular Los Angeles flea markets. Passing through Pasadena? 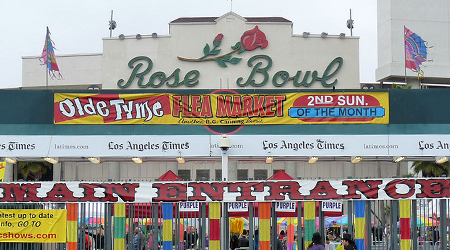 Plan on perusing the ever-popular Rose Bowl Flea Market on the second Sunday of each month. Set in the 90,000-seat Rose Bowl stadium, the venue is massive, meaning there is something for everyone — new or old, cheap or pricey, handmade or restored — offered by an eclectic mix of more than 2,500 vendors. Admission is $9 for a 9 am entry, $12 for an 8-to-9 am entry, $15 for a 7-to-8 am entry and $20 for 5 am access for those extra-eager shoppers. Located at Long Beach Veterans Stadium, this antique market, known as "the flea market with style," is a far more manageable version of the Rose Bowl. On the third Sunday of every month, there are roughly 800 vendors spread out over 20 acres, offering a range of clothing, vintage jewelry, antique furniture and unique baubles and trinkets. For a $6 admission, hours are 6:30 am to 2 pm. But for $12, early birds can arrive between 5:30 and 6:30 am. For a smaller, more intimate flea market, known for antiques, collectibles and a vast vintage record selection, visit the Pasadena City College flea market. Held in the college's parking lots along the east and west side of campus, this free-admission event hosts more than 400 vendors, including a rotating line-up of food vendors. The Pasadena City College flea market opens the first Sunday of every month from 7 am to 3 pm. This is just a sampling of many flea markets in and around the Los Angeles area. Other popular flea markets include the Melrose Trading Post, Santa Monica Airport Flea Market and the downtown Artist & Fleas, among many more. Happy treasure hunting!